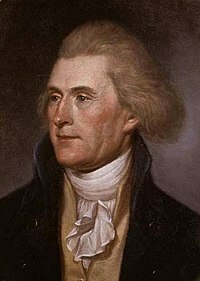 Ba é Thomas Jefferson (13 Aibreán 1743 - 4 Iúil 1826) 3ú uachtarán na Stát Aontaithe Mheiriceá. Bhí sé i bhfeidhmeannas ón 4 Márta 1801 go dti an 4 Márta 1809. I rith a théarma oifige, cheannaigh sé críoch Louisiana ón Fhrainc in 1803. In 1808 stad sé an tradáil sclábhaí eachtraí. Ba iad Peter Jefferson agus Jane Randolph a thuismitheoirí. Bhain sé amach céim ag an Coláiste Liam agus Mháire (1760-62). Tugadh an leathanach seo cothrom le dáta an 25 Iúil 2017 ag 10:50.